Great acting, superb singing, and a look at the dark side of Wonderland! This is Frank Wildhorn's (music), Jack Murphy's (lyrics and book), and Gregory Boyd's (book) wonderfully sinister, almost Tim Burton-esque take on a much-loved children's classic. Wildhorn's music is both fun and a little bit scary at one and the same time, with some genuinely brilliant moments and lovely harmonies, whilst the story is both familiar and strange. In this version, Alice is a disgruntled and disillusioned adult, who in the space of just a few hours manages to have her car stolen, lose her house keys and get fired from her job. She is an aspiring writer, who is in a dead-end job to please her now ex-husband; and she finds herself stuck in a small garret flat where the wallpaper is peeling and the room needs a carpet, trying to support herself and her teenage daughter, Ellie. She expresses the wish that she no longer wants to live in the real world. Enter one White Rabbit, whose job it seems is to visit the real world and entice those dissatisfied with it down into a subterranean place where life is beautiful and happy all the time. All that is necessary in order to stay there forever in a comatose state of induced happiness and idiocy is to allow the Queen Of Hearts to cut your head off. Apparently it hurts the first time, but, after that, it doesn't matter at all, as you simply get used to it! 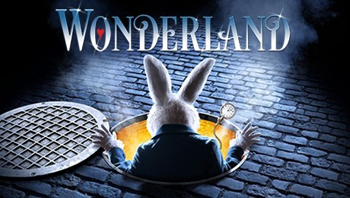 And so down into this 'wonderland' go not only Alice and her daughter Ellie, but also a kindly but rather nerdish neighbour who is secretly in love with Alice. Cue for a song.... Welcome To Wonderland! I am often at odds these days with set designers. I either find their designs too clever ( as in the recent Opera North series ), or too minimal, as here. Designer Andrew Riley has created a very adult and intellectual set. In actuality nothing more than a tunnel with tiny additions for each scene. Sadly, for me at least, this really did not work. I loved the idea of a tunnel in order to take me to Wonderland, but it oughtn't to have actually been Wonderland. The word wonderland is an absolute gift for any designer, as the possibilities are endless, and yet we had to be content with a set that wobbled at times, and clanged when put together. Most of the items of set brought in were extraneous and unnecessary and could have been put to such intriguing and interesting uses. Large red roses and topiaried trees at the side of the stage just adorned the stage, nothing more. A well-trimmed hedge came on several times but served no purpose whatsoever, and a book fountain appeared in the second act to just stay there for a short scene and get carted off again. Sadly then, for me, the set was very much a let down. So much more could have and should have happened. Thank goodness then that the performances were excellent. When the Palace Theatre stage was graced with not one, not two but three true doyens of the theatre, one would expect nothing less; but with this winning trio of Kerry Ellis (Alice), Dave Willetts (White Rabbit) and Wendi Peters (Queen Of Hearts), we really were treated to some utterly first rate singing and acting. Watching Willetts, with his 65th birthday on the horizon; dancing, running and singing tonight like a twenty-year old was both inspirational and incredible. And my favourite number in the whole show had to be Peters' stunning interpretation of 'Off With Their Heads'. In order to save Wonderland from the tyranny of the Queen, and to get themselves back into the real world, our three protagonists soon realise that they need to go through the looking glass in order to allow their hidden personalities to surface. The mirror doesn't just show you your alter ego, but by walking through the mirror, you come out changed in to it. This has a rather disastrous result for Ellie (Naomi Morris), who comes out an awkward, belligerent and independent teenager with issues, but for Jack (Stephen Webb), the shy neighbour, it does wonders for him and comes out a hero and shows Alice that he is her true knight in shining armour. His song, 'One Knight' with the shameless Mickey-take of all Boy Bands in history was hilarious. Other notable roles in the show are Divine Cresswell as a very loveable Dormouse, Kayi Ushe as a smooth soul-singing Caterpillar, and Natalie McQueen's perfectly placed madness as The Mad Hatter. The show is high energy and full throttle most of the time, although the quieter, more reflective songs are handled well too, and is sensibly directed by Lotte Wakeham and some interesting and effective choreography by Lucie Pankhurst. This show though, despite its title and premise, is much more for an adult audience than youngsters, and what little humour there is in the writing, seemed somehow contrived and out of place - I am thinking especially about the OFSTED joke. However, all that notwithstanding, this is a new, fresh, and alive new Musical, and has all the ingredients necessary to make it a success. The final choral anthem was simply lush (Finding Wonderland), and although not 'perfect', Wonderland is certainly Wonderful!